This evening I grilled the last few steaks that I picked up from Costco this weekend (Beef Loin Top Sirloin Cap Steak) that I used over the weekend to make beef kabobs with. I marinated the beef when I made the kabobs, but wanted to see how these steaks would be without marinating. I was very pleasantly surprised. Not only were they flavorful, but they were super tender as well. I kept the preparation of these steaks very simple. I seasoned both sides with McCormick's Grill Mates Spicy Montreal Steak Seasoning and then grilled them for 4 minutes per side on a hot grill. To serve them, I placed a pat of Kerrygold's Garlic & Herb Butter on top to melt and flavor them. 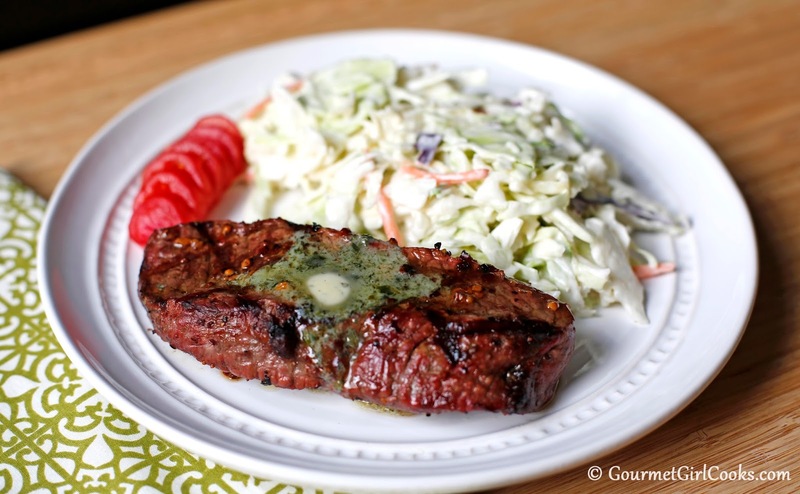 Who needs steak sauce when there's Kerrygold Garlic & Herb Butter? They were absolutely amazing! The steaks had the tenderness and texture of a filet mignon steak. I couldn't tell the difference (except for the shape of the steak). We thoroughly enjoyed these and I will most definitely be purchasing these again. 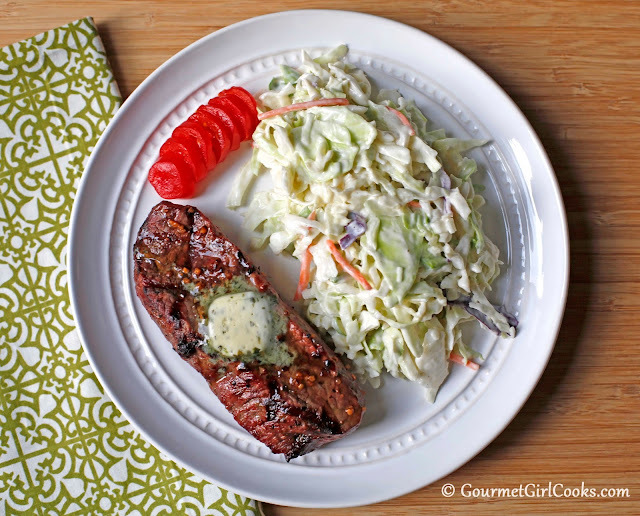 Before grilling the steaks, I made my Easy Coleslaw to go with our meal which only takes about 5 minutes to toss together with just a few simple ingredients. It took me about 5 minutes to prep the coleslaw and 10 minutes to prep and cook the steaks. How is THAT for quick and easy peasy? I snapped a couple photos below. Enjoy!